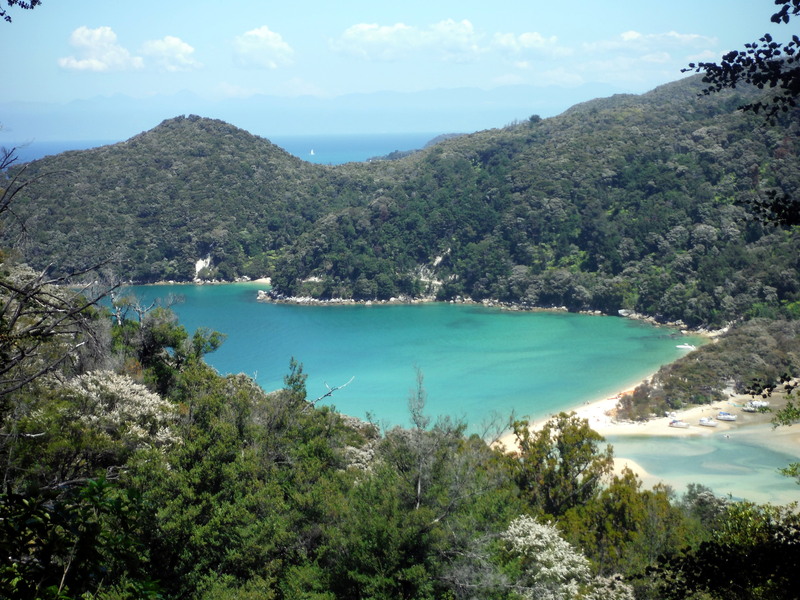 The pristine bays of Abel Tasman National Park are divided by fingers of land that reach out into the ocean and range in width from pinky to palm size. Walkable beaches do not exist the entire way, and so the trail tends to cross the beaches at the bays before climbing up and over a finger or two and descending back down to sea level. 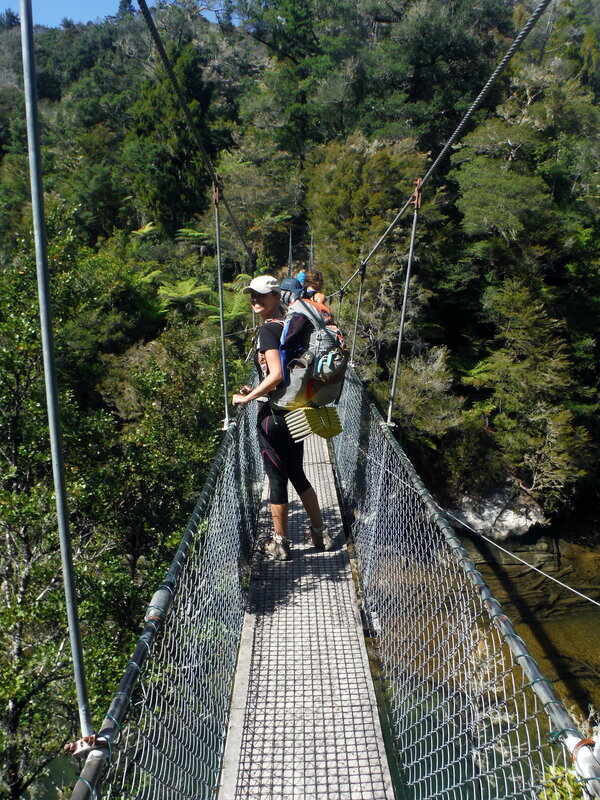 Our stomachs were rumbling by the time we finished the beach crossing at Onetahuti (or at least mine was!) 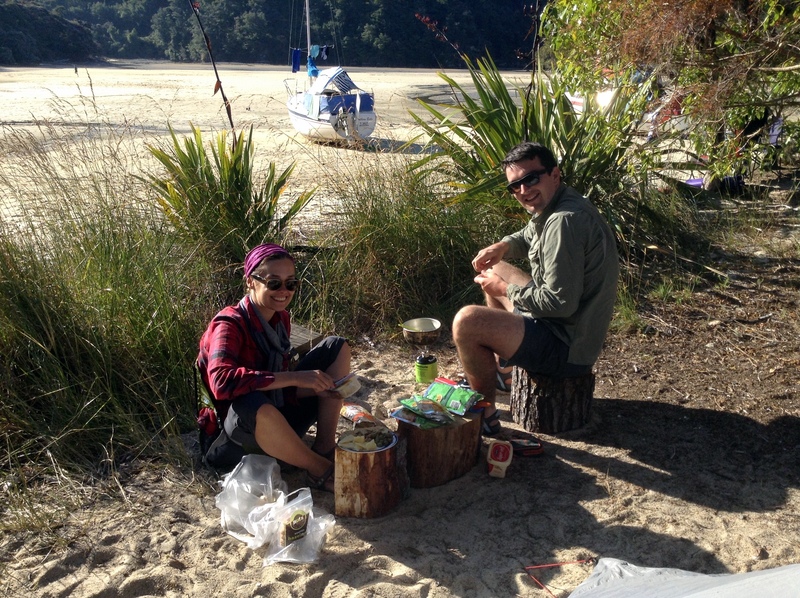 on that first day, and we resolved to stop for lunch at the beach at Tonga Quarry, which was just over the next ridge. 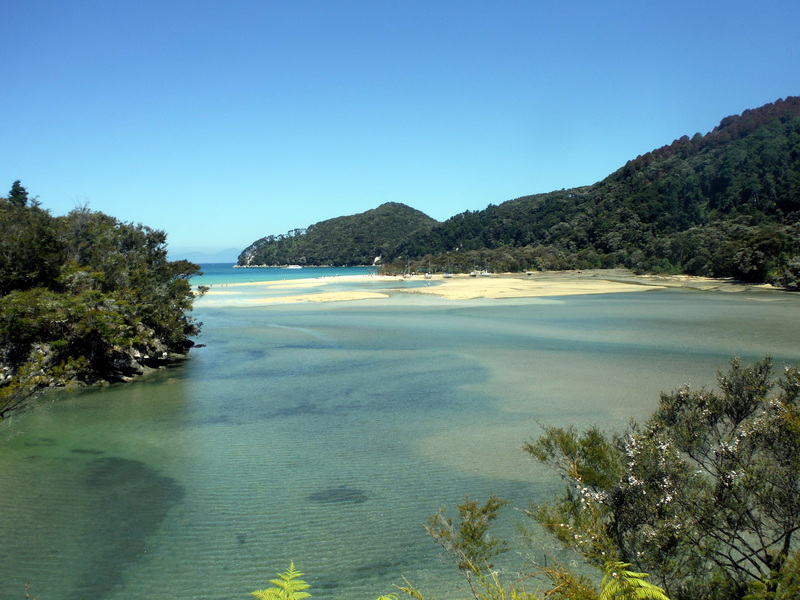 This beach was smaller than the wide open curve at Onetahuti, but the bay was much less pronounced and more open to the ocean, making for just a slightly choppier, windier shore. 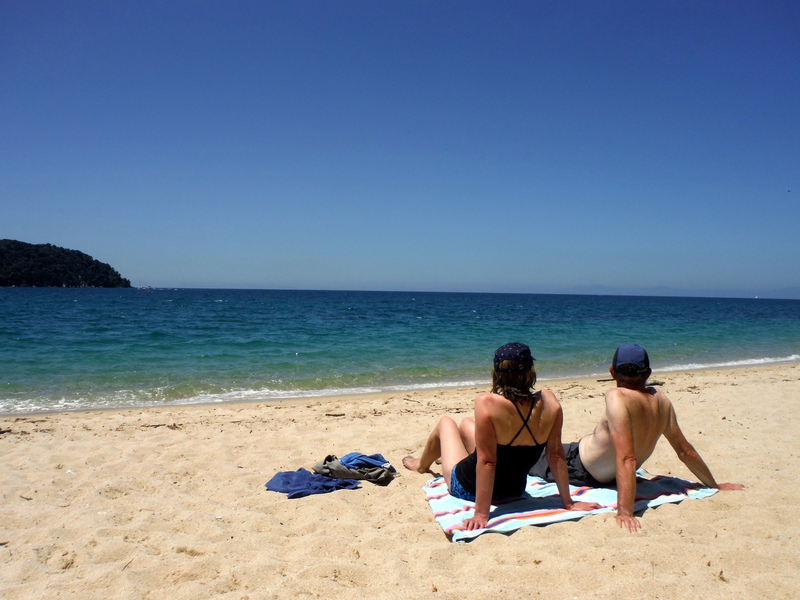 We changed into our bathing suits (or togs as the Kiwis call them) and headed for a dip while the lunch team worked on sandwiches. Not a bad place for a lunch break! It’s hard to spend so much time with a view of these crystal waters without becoming infatuated with the idea of plunging in. As the day grew later and warmer I spent the entire hike from Onetahuti to Tonga Quarry daydreaming about a dive into the jewel toned ocean. It reminded me a lot of the calm Caribbean – my very favorite body of water – and I couldn’t wait to rest my limbs with a refreshing float. 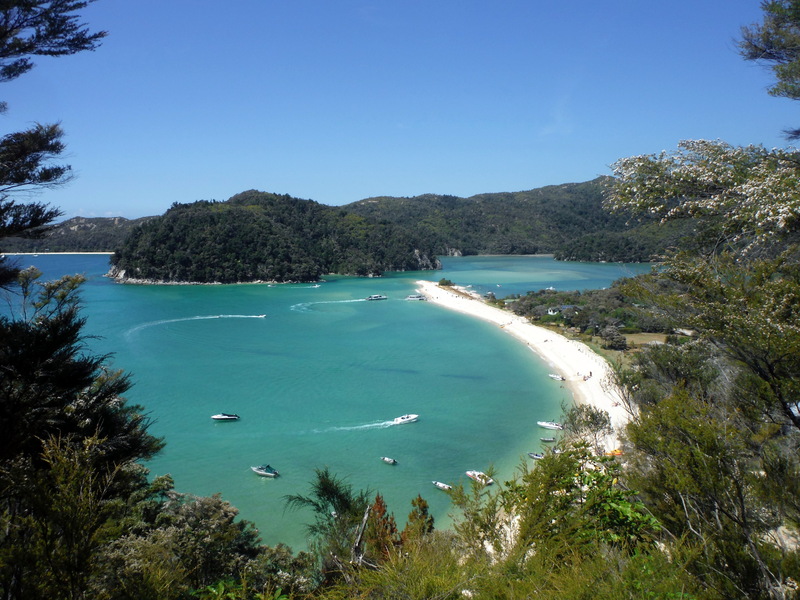 It turns out, while the Pacific Ocean in the summer on the south island of New Zealand looks a lot like the Caribbean, it does not feel even a little bit like the Caribbean. To be fair, my Kiwi hosts would probably debate my use of the word frigid – they didn’t seem to be too bothered by the low temperature and lingered in the giant ice bucket for a long time. However, my tropical sensibilities could not handle it. 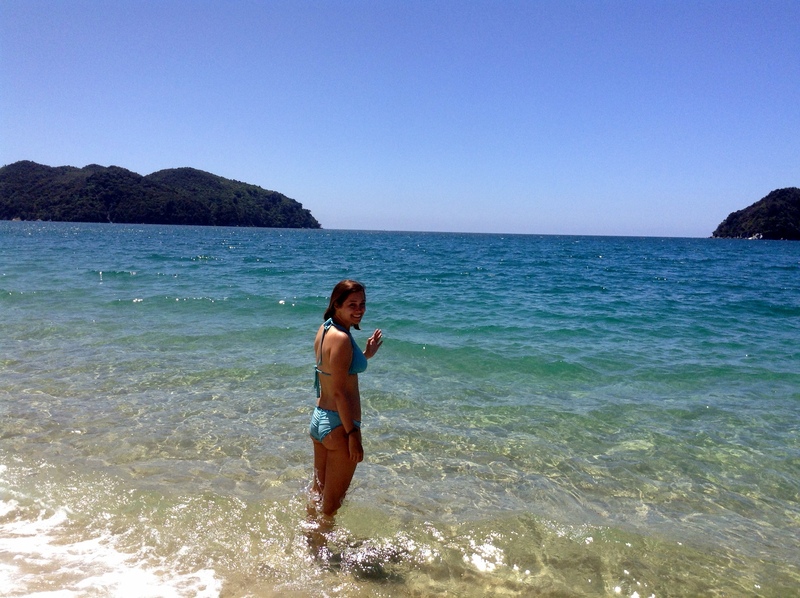 I willed myself to dunk my head under the teeny waves, and after a lot of encouragement and an excruciating, paralyzing period of ‘OH MY GOODNESS IT’S COLD’ – I finally got myself together and managed to plunge under. Then, immediately, I made a run for the beach. Laid out on the sand under a strong New Zealand sun (no really, a hole in the ozone layer makes UV rays in this part of the world considerably more intense), the trauma of the frozen dip began to fade blissfully away as I allowed that wonderful nearby star of ours to eviscerate any remnants of that chilly discomfort I find myself so sensitive too. We lingered at Tonga Quarry for another 40 minutes or so before finishing our lunches and packing up for the second part of the day’s trek. Our first view of Bark Bay, the campground was nestled in the trees of the sandbar on the right. It was closing in on 4pm by the time we made the first sighting of our home for the night. 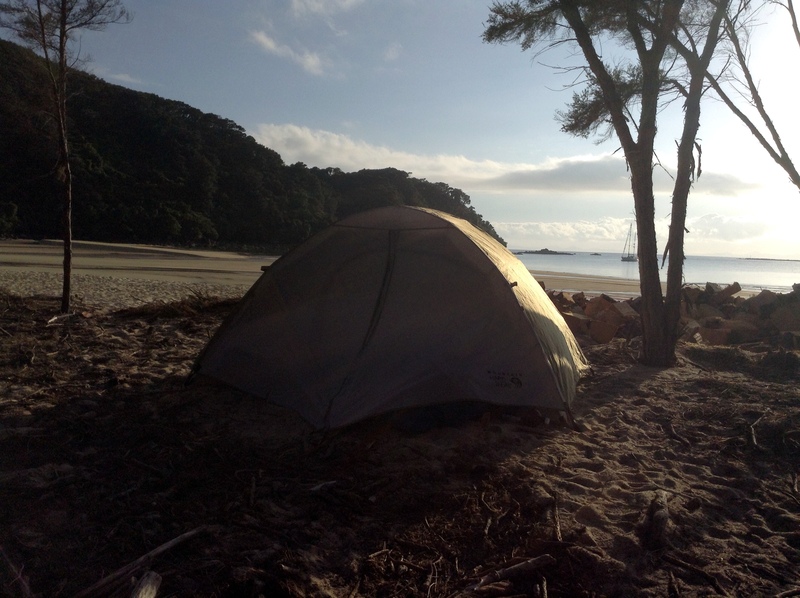 The campground at Bark Bay sits restfully on a sandbar between the Pacific Ocean and an estuary. We had expected to arrive much sooner in the day – but our coffee shop stop and lingering lunch turned a 3 hour hike to 6. Still, we found the perfect spot at the very end of the campground, and Tom and I happily pitched our tent on the sand overlooking the beach at Bark Bay. First things first: we unloaded the beer. It turns out, there are some advantages to hiking along freezing cold water. Tom and I were on dinner duty that night, and I like to think that we wowed our crowd with our carefully prepared, vacuum-sealed raviolis. I was happy to accept the compliments our team graciously bestowed on we cooks as I considered one of my favorite elements of backpacking: after a long hike, everything tastes amazing. Hard at work preparing a pre-packed feast! Another thing I love about backpacking? A good night’s sleep. 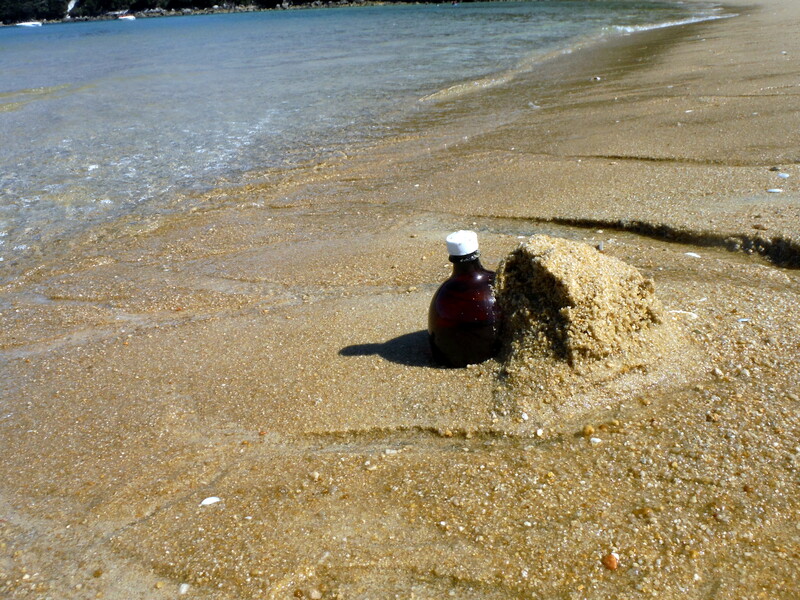 It helped that we had sand for our mattress and the loveliest ocean lullaby. Upon waking to our second beautiful day on the trail, I was treated to my very first taste of a New Zealand breakfast staple. Weet-Bix are whole-grain breakfast bars that are typically soaked in milk and eaten like cereal. It reminded me a lot of Kelloggs Frosted Mini Wheats, except in the form of one large bar and without the frosting. Tasty? Well, the Kiwis are crazy for them. Filling? It does the trick. We were off. 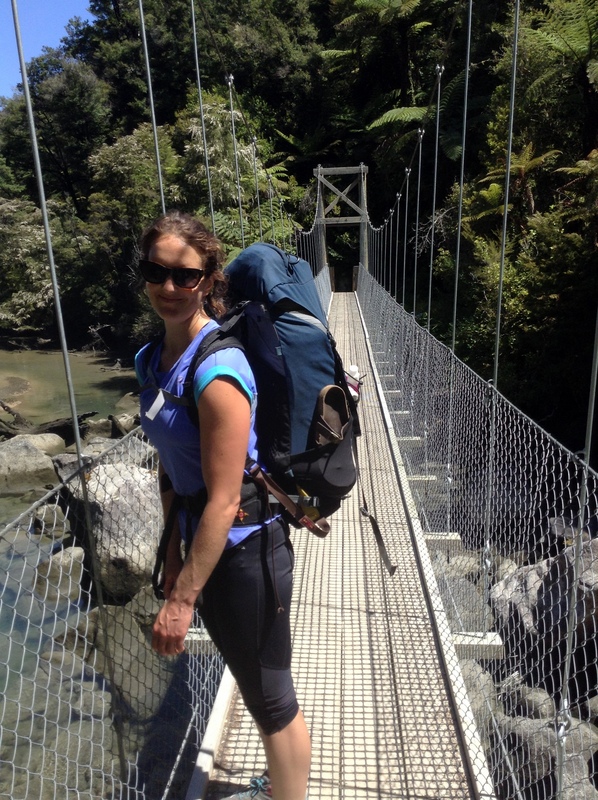 I am obsessed with New Zealand’s suspension bridges. I first encountered them in Fiordlands National Park on Tom and I’s August south island roadtrip. I find them beautiful, and their bounce feels just dangerous enough to make their utility into the teeniest thrill. 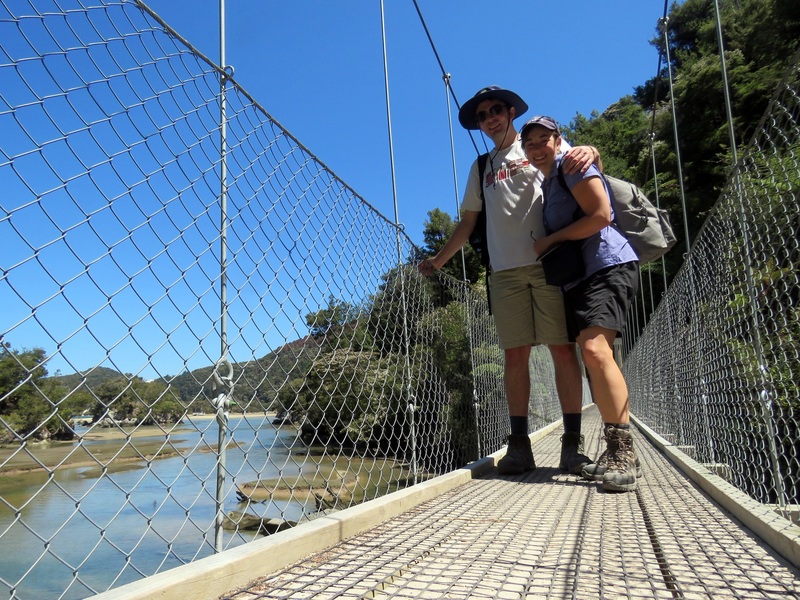 On our second day’s hike from Bark Bay to our camp at Anchorage, we encountered many beautiful suspension bridge crossings. Our group hiked in loose sets and separated based on pace. 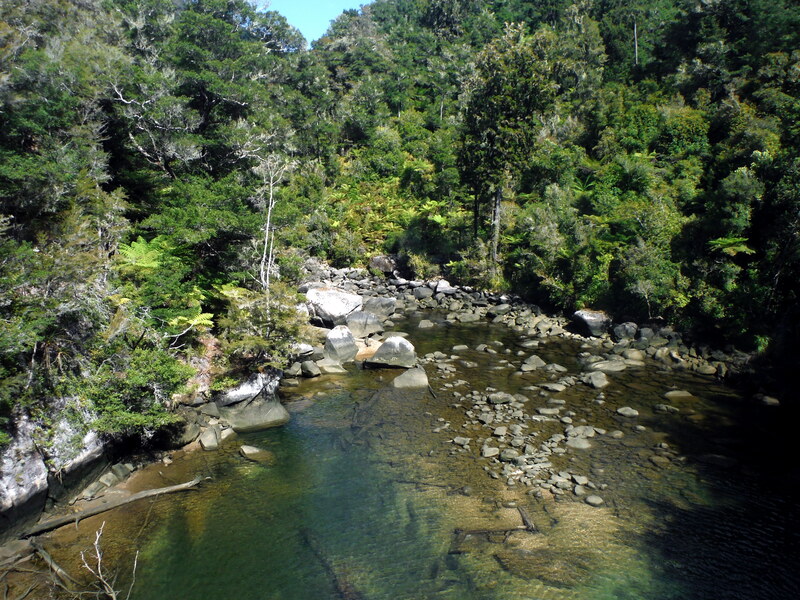 We had agreed upon our departure from Bark Bay that we would meet for lunch at Torrent Bay on this second day. I was feeling ravenous as we reached our morning’s final peak (if only those Weet-Bix had come with just a little frosting). But all physical discomforts evaporated upon sighting the bay from above. Sure, it helped to know that food was near. But is that a view, or what? Click here for Part III!